Tens of millions of Christians live in China today, many of them leading double lives or in hiding from a government that relentlessly persecutes them. Bob Fu, whom the "Wall Street Journal "called "The pastor of China's underground railroad," is fighting to protect his fellow believers from persecution, imprisonment, and even death. 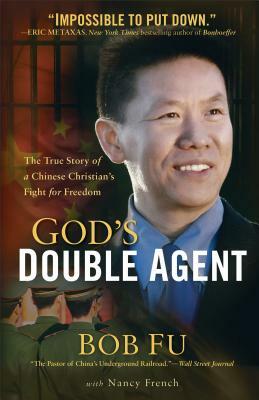 "God's Double Agent" is his fascinating and riveting story. Bob Fu is indeed God's double agent. By day Fu worked as a full-time lecturer in a communist school; by night he pastored a house church and led an underground Bible school. This can't-put-it-down book chronicles Fu's conversion to Christianity, his arrest and imprisonment for starting an illegal house church, his harrowing escape, and his subsequent rise to prominence in the United States as an advocate for his brethren. "God's Double Agent "will inspire readers even as it challenges them to boldly proclaim and live out their faith in a world that is at times indifferent, and at other times murderously hostile, to those who spread the gospel. Bob Fu is a former dissident and pastor of an illegal underground church in China. As a former prisoner, Fu has unique insight into the plight of Chinese Christians and an unparalleled network on the ground. He and his wife, Heidi, fled to the United States as religious refugees in 1997. He currently runs ChinaAid, a nonprofit organization that tirelessly advocates for the underground church in China and for political dissidents, as well as the lawyers and activists who place their lives on the line to defend them. Find out more at ChinaAid.org. Bob is a distinguished professor on religion and public policy at Midwest University and a research PhD candidate at Durham University, UK. In addition to being the China analyst for Voice of the Martyrs, Bob is editor-in-chief of "Chinese Law and Religion Monitor," a journal on religious freedom and the rule of law in China, and guest editor for "Chinese Law and Government," a journal of UCLA. He received the 2007 John Leland Religious Liberty Award from the Southern Baptist Ethics & Religious Liberty Commission (ERLC). In 2012 Midwest University awarded Bob the Honorary Doctorate Degree on Global Leadership. He currently lives with his wife and their three children in Midland, Texas. Nancy French is a two-time "New York Times" bestselling author. Her books include "Home and Away: A Story of Family in a Time of War "(with David French), "Not Afraid of Life" (with Bristol Palin), "A Winning Balance" (with Shawn Johnson), and "Red State of Mind." She lives in Tennessee. Reach her at NancyFrench.com.